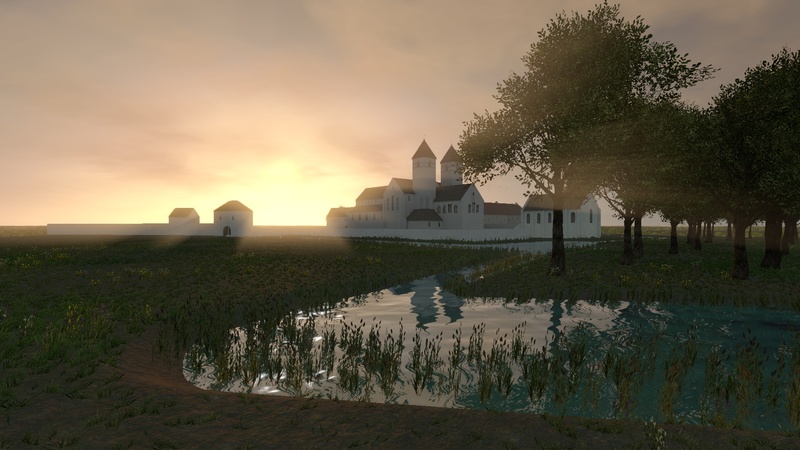 Here are some images of our work in progress on the real time visualisation of the abbey and village of Ename. 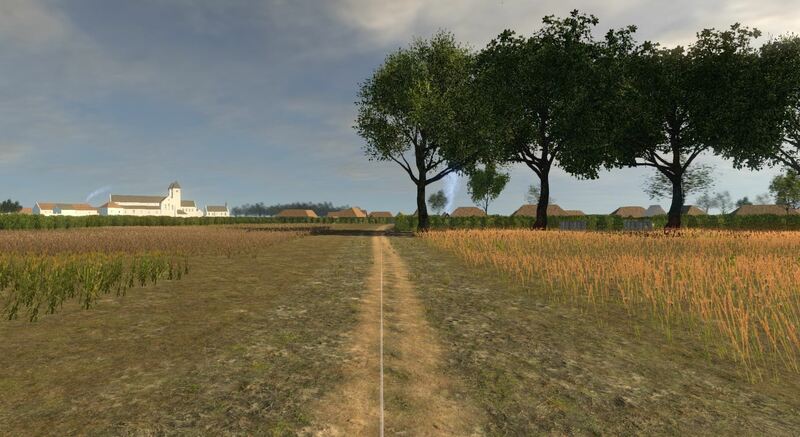 This real time visualisation is used in a virtual walk-through for the Ename visitor centre and serious game for the educational department of pam Ename (provincial archaeological museum Ename). 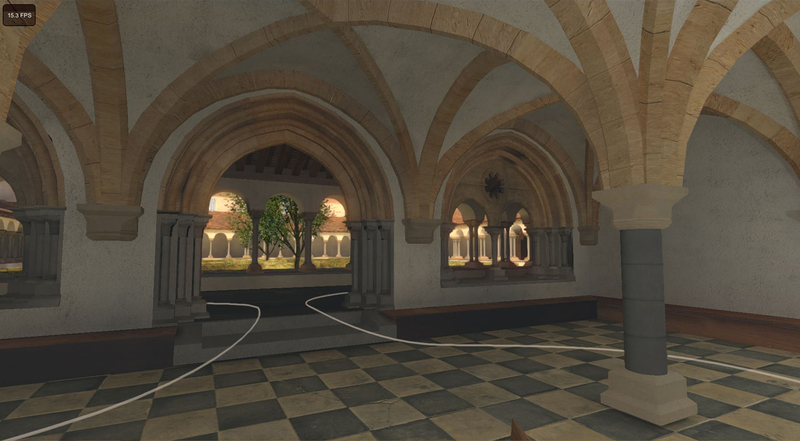 The navigation through the virtual reconstruction uses a predefined path (the white line in the images below) and arm gestures (that are captured by a Kinect camera). This video shows how it works. 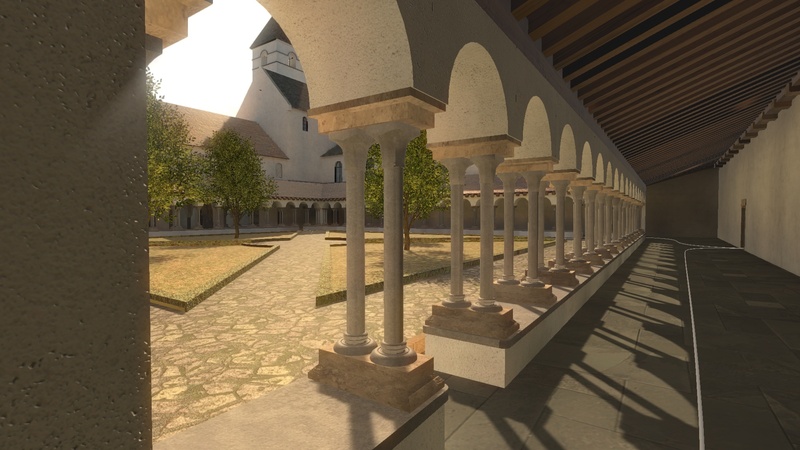 The application is used by guided groups as a virtual walk-through of the abbey, showing the splendour of the abbey in the 13th century and making the relation to the preserved archaeological remains in the archaeological park next to the visitor centre. 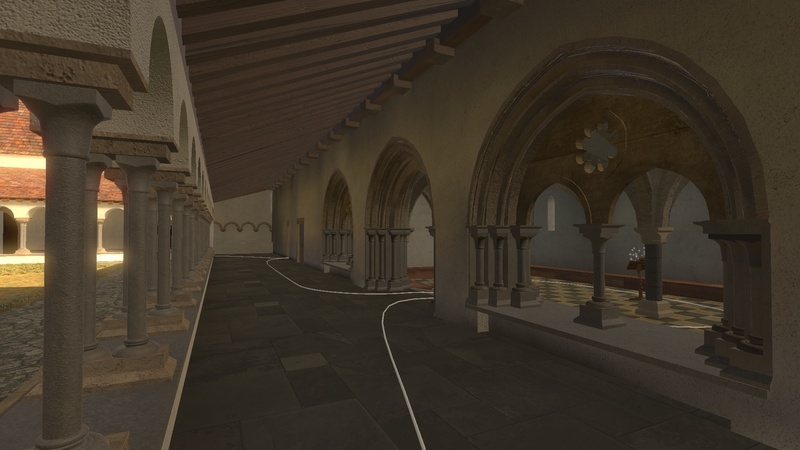 It also deploys as an educational game for groups of school children, giving them an interactive 3D quest to recover a precious object (the crosier below). 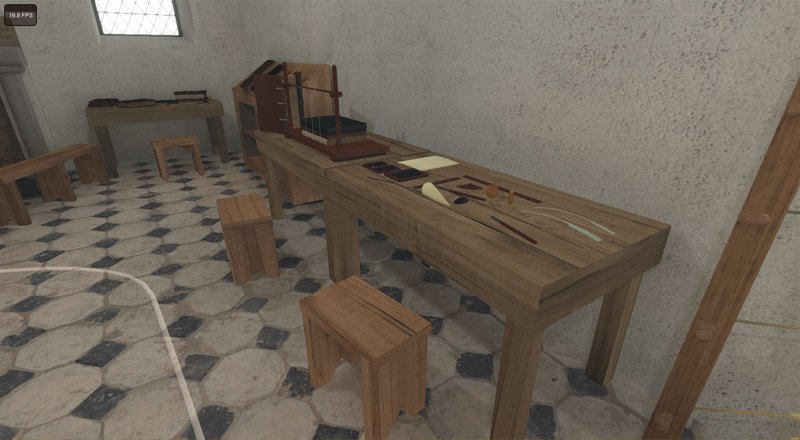 The educational game is setup as a time travel experience. 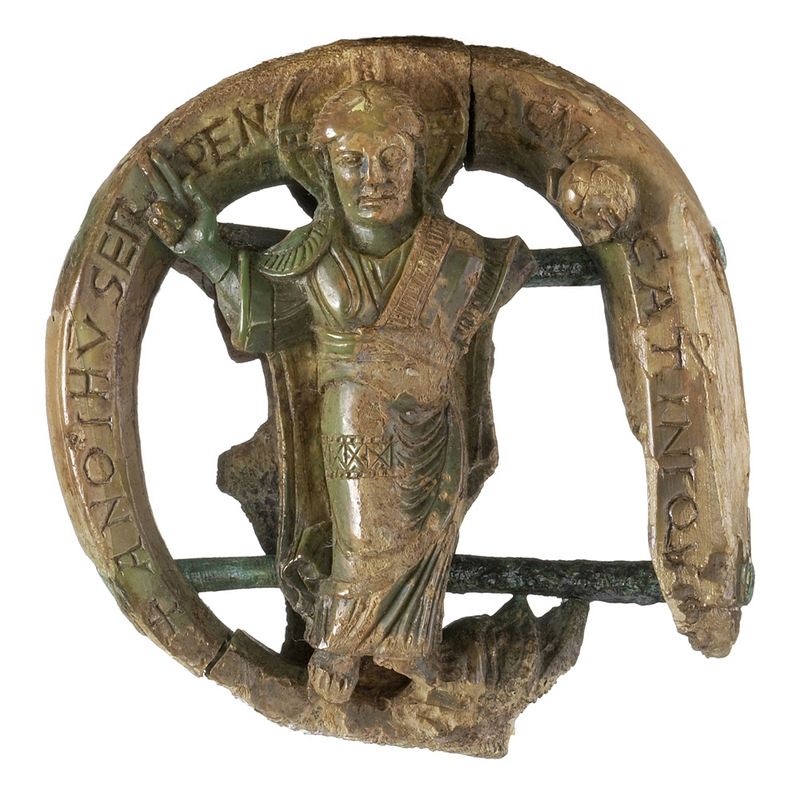 The story of this game plays on the morning of Pentecost of the year 1290 and involves an ivory crosier, the most outstanding object that has been excavated in Ename and that has been declared Flanders’ Masterpiece in 2013. 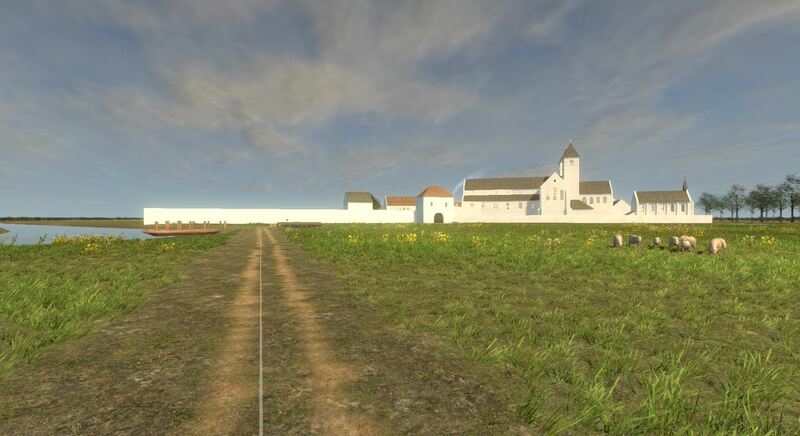 Historical characters, such as Martijn van Torhout (monk and scribe at the abbey scriptorium), Jan and Arnulf van Oudenaarde (lords of Oudenaarde) and Gerard van Strijpen (abbot of the Ename abbey) feature in this interactive application. Martijn van Torhout was one of the first authors to write in the Dutch language, he mentions 1290 as the year of writing in one of his texts. His writings, known as the Ename codex, are also considered as Flanders’ Masterpiece. 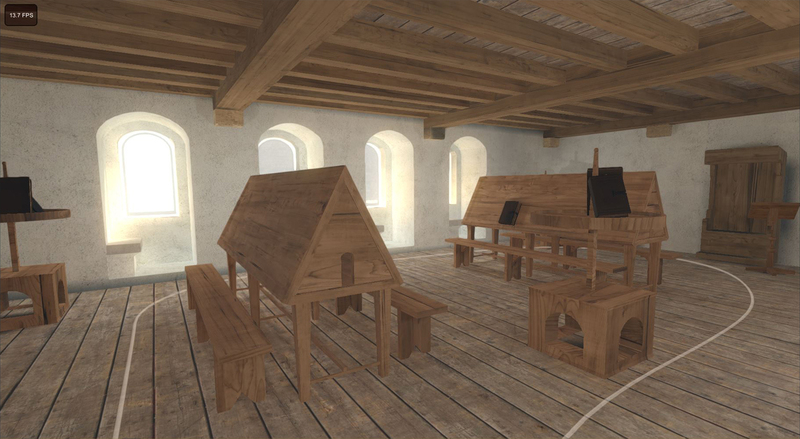 Many objects that are encountered during the quest have a small story to tell and show this by their sparkling nature (see for example the granary below, based on a physical reconstruction in Germany). By selecting these objects by reaching out with two hands, their story is told. One can manipulate the virtual object and even take it through simple gestures. 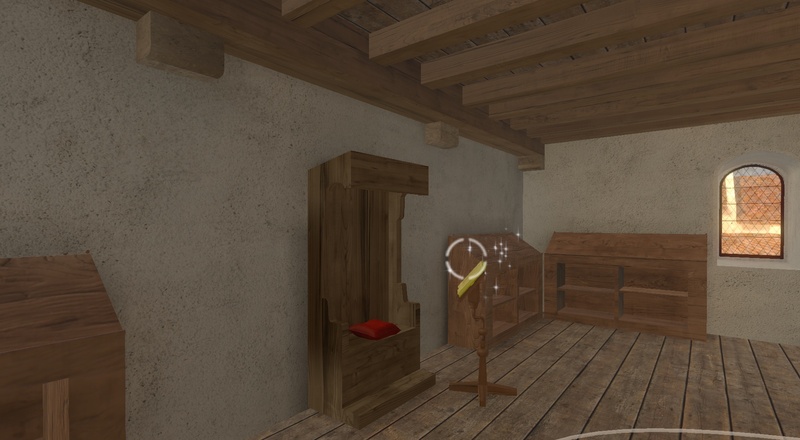 In this way, every interactive object reveals a piece of the information to finalise the quest successfully. 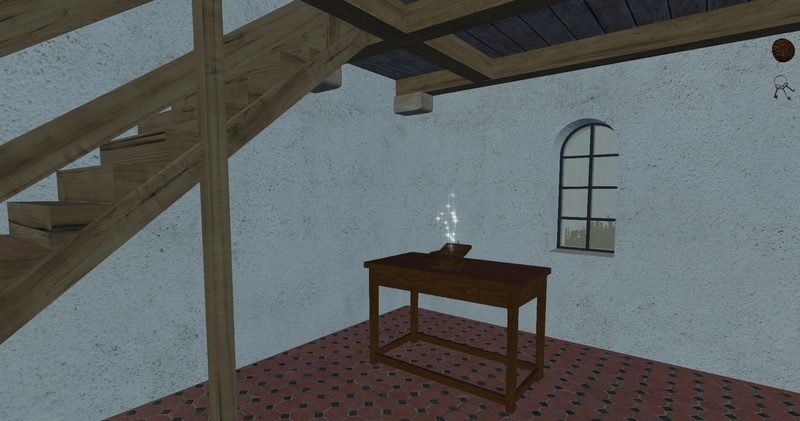 The virtual reconstruction has a rich 3D soundscape as many objects and animals have associated sounds, creating a strong feeling of presence. 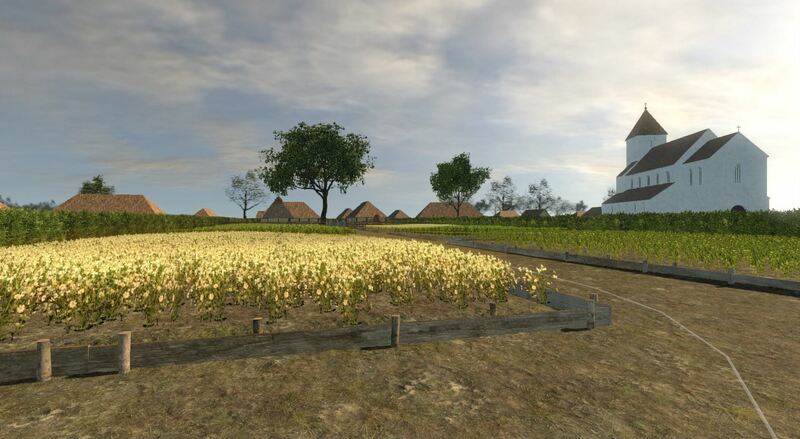 The village is centered around a common or green, a central terrain between the houses where the animals can stay safely during the night. During the day, the sheep, cattle and pigs are taken to the grassland and woods to graze. 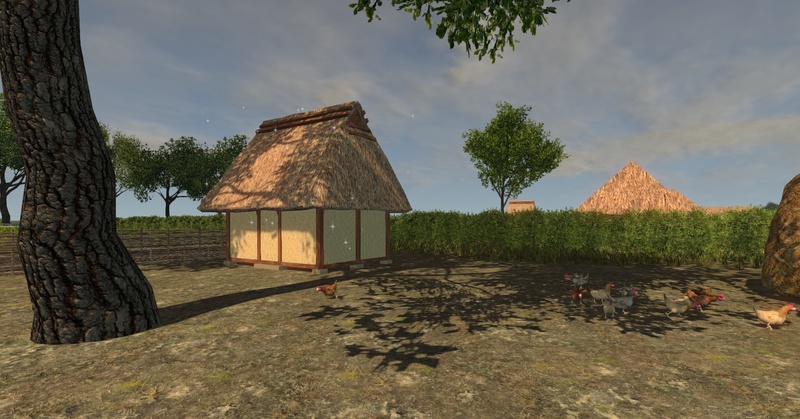 In this way, villages and early cities have remained very compact as everybody wanted to live next to the common to keep an eye on their livestock. 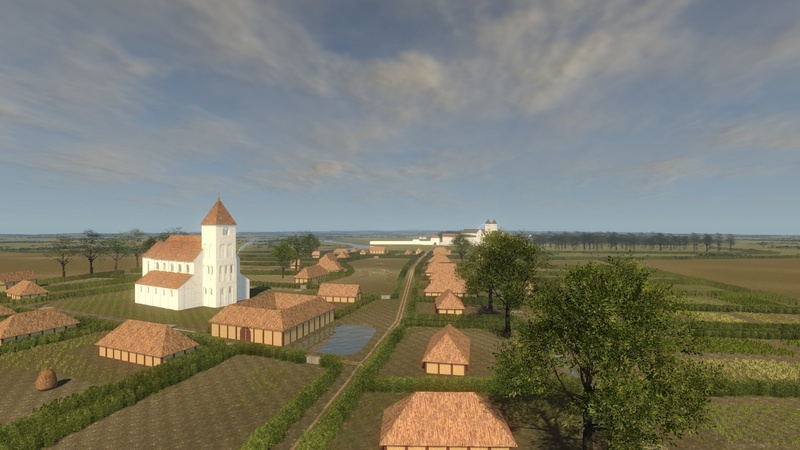 Central commons disappear in Flanders during the 16th century when livestock is kept more and more in stables. 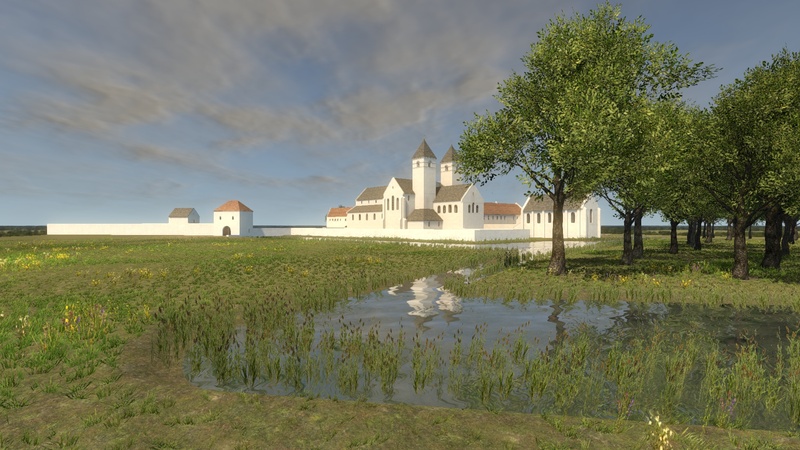 As the abbey owns the Ename wood and as wood is the main source of energy and building material in the Middle Ages, the abbey starts in the 13th century to plant and raise trees in areas protected by hedges. 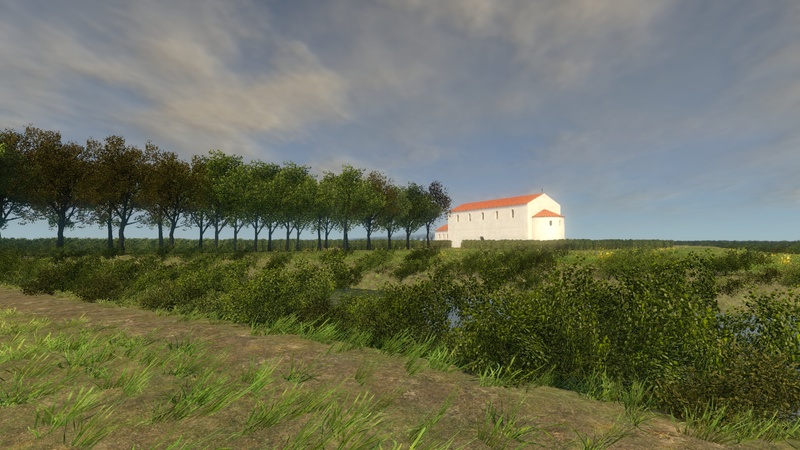 This activity by the Ename abbey is one of the oldest recorded acts of forestry in the world. So the abbey is selling wood in all its forms: unprocessed tree trunks, wooden beams ready for use in construction, fire wood, charcoal. The abbey has its own timber harbour to ship these products to its customers. The abbey has also its own ferry service to cross the river Scheldt. Next to the ferry, there is a chapel, dedicated to Our Lady. 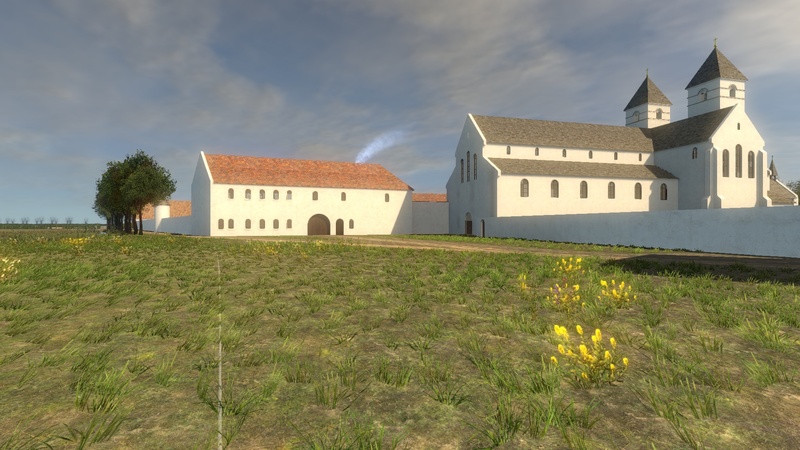 This building was originally a palace building of the Ottonian nobility that founded the trade settlement of Ename (see our other blog that covers this period of the history of Ename). 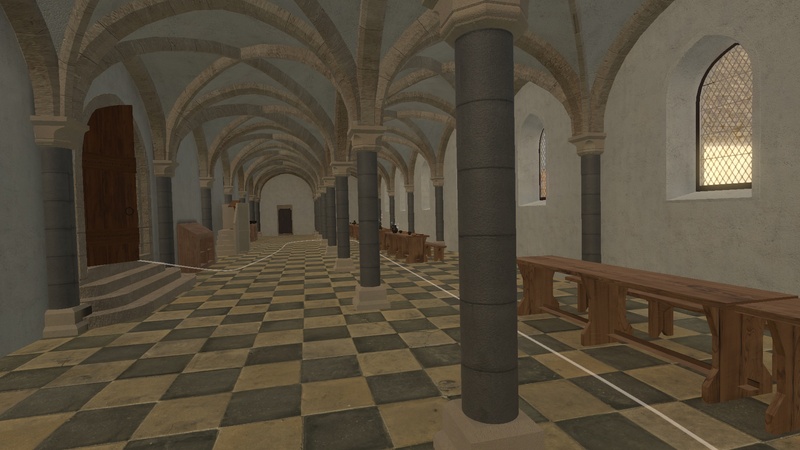 Inside the abbey, the quest brings us into the chapter room, the cloister garden, the scriptorium and the library. In the scriptorium, one of the texts of Martijn van Torhout is on the writing desk, partially finished (through digital restoration of the preserved manuscript). 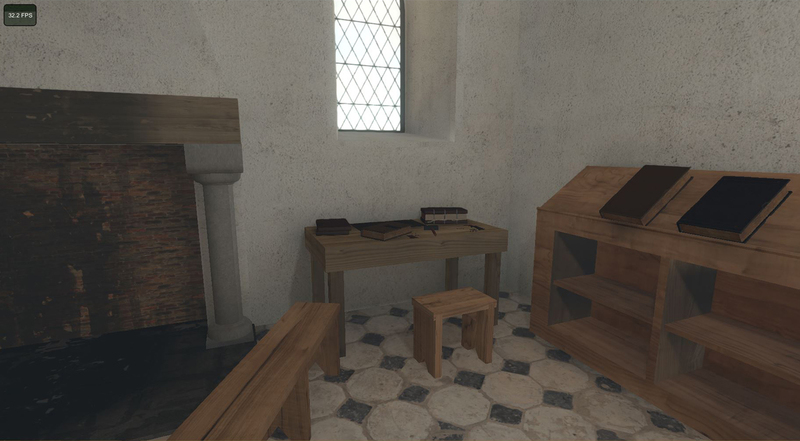 As all steps of the book making process are visible in this scriptorium, the application can also be used by the guides to show the different spaces of the abbey and explain for example the process of medieval book production. 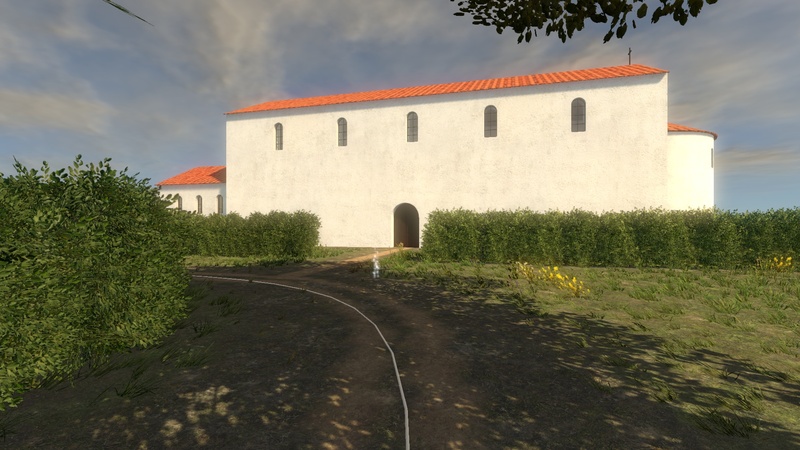 While showing this interactive virtual reconstruction, the archaeological remains of the abbey are visible through the window of the room (educational department on the second floor of the visitor centre). 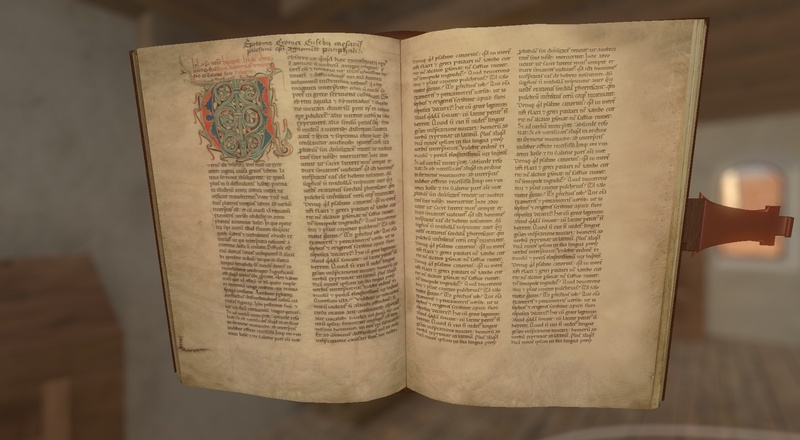 Many objects in the game are on display in the museum or preserved in other international institutions (for example a book from the Ename library is now preserved in the University library of Leiden in the Netherlands, see below). When selecting an interactive object through a two hands gesture, a circular cursor appears that can be positioned on the object (see below), making the object float in mid air (see below), manipulated by moving both hands. While manipulating the object, a small story about the object is told. One can take the object or put it back. 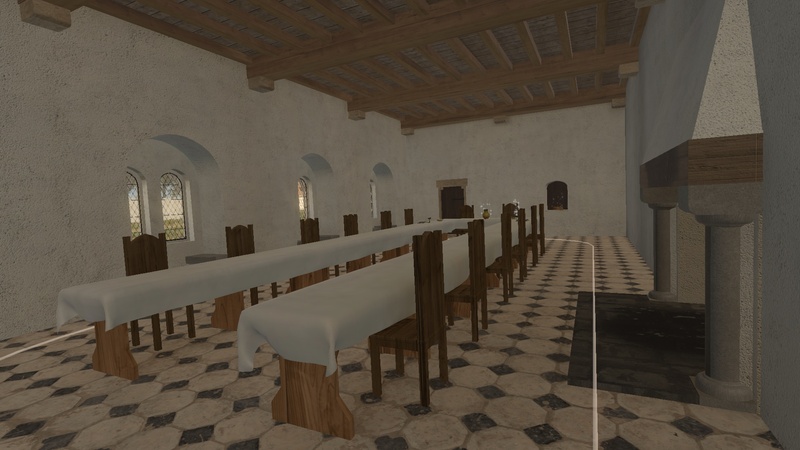 When visiting the refectory of the monks and the refectory of the guests, several interactive objects refer to objects in the museum. 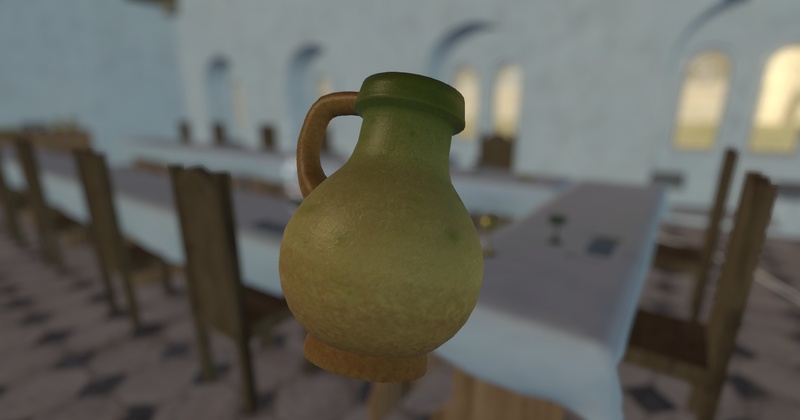 But not all museum objects are intact and complete, so the game shows the digitally restored versions of a pitcher (see below), cups, plates, a book lock and a candle dipping container, all in context. 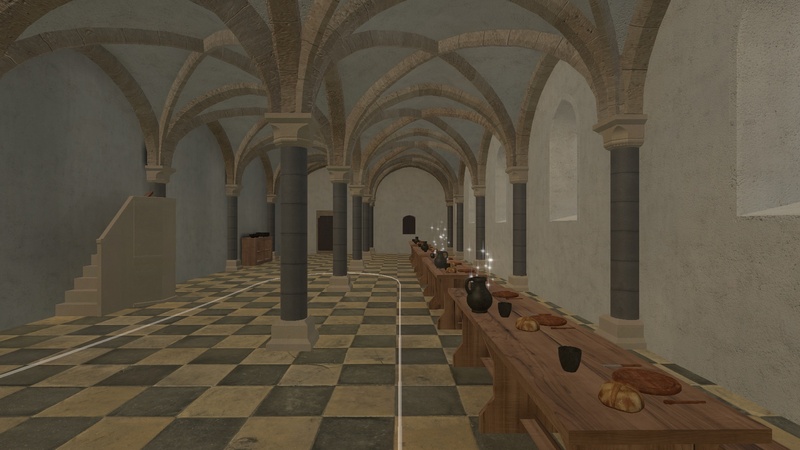 For guides, this is also very useful as they can show the abbey, highlight its objects through interactive manipulation, tell stories linked to the objects (for example: candle making) and visit the museum afterwards, showing the real objects. 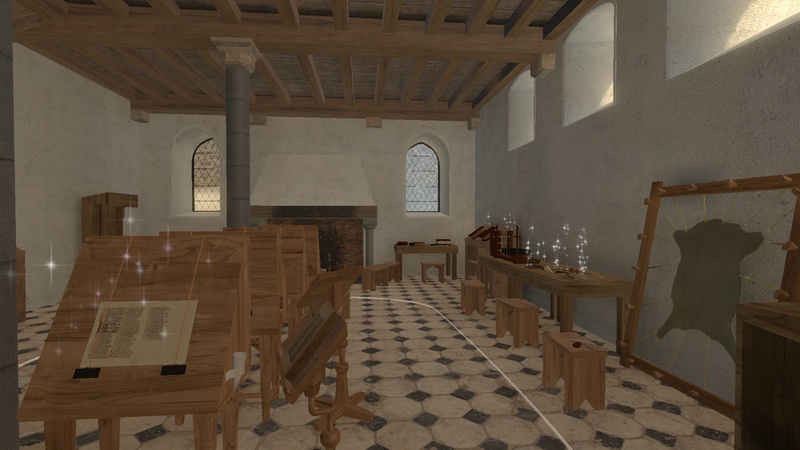 Guides can position themselves at several places in the reconstruction to give virtual tours of specific parts of the abbey or the village, focusing on specific themes, places or objects. 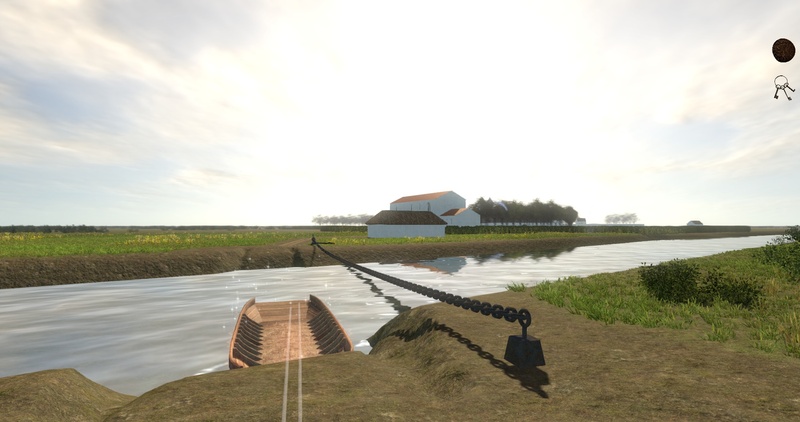 After crossing the river with the ferry boat (for which you need a coin to pay), the game concludes when opening a wooden chest (you have to find the keys) that contains the repaired crosier. 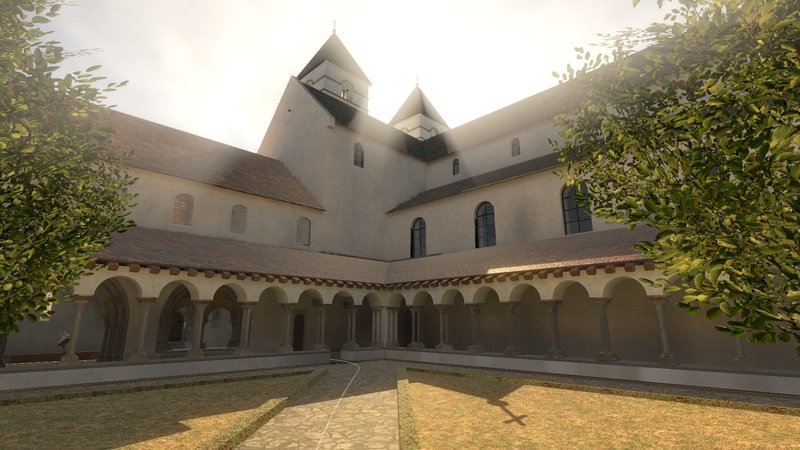 Before returning to the present, the game ends by mentioning the events that will happen in the abbey in the century after 1290.